With her namesake news website, Arianna Huffington helped change digital media. She has a loftier ambition for Thrive Global, her new corporate wellness company. "Thrive Global is basically based on the need to change the way we work and live, and make it more sustainable," Huffington told CNNMoney. "We see more and more how people are sacrificing their health, their relationships because of a faulty belief that in order to succeed they have to burn out." 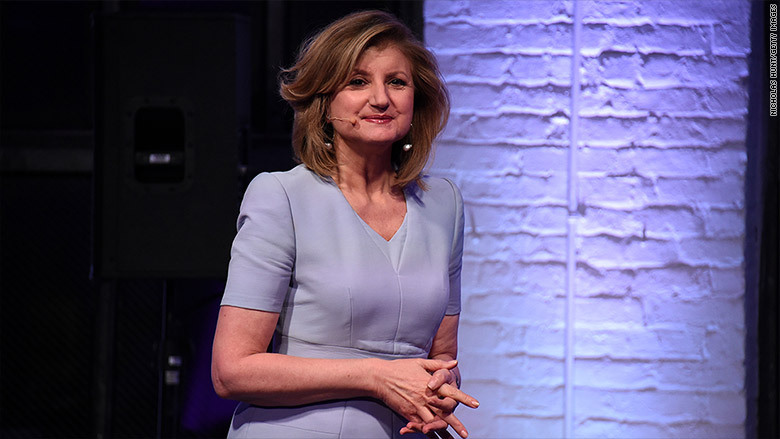 Huffington stepped down last month from the Huffington Post, the online news powerhouse she founded more than a decade ago, to concentrate full time on the new venture. Since then, Thrive has set an official launch date of November 30 and staffed up. The latest big name to come aboard is Callie Schweitzer, who will join Huffington as managing editor of Thrive. Schweitzer, 27, has a reputation as a digital media wunderkind. She spent the last three years at Time Inc. -- first overseeing digital innovation for Time Magazine and most recently serving as editorial director for audience strategy for the company at large. Earlier this year, Schweitzer helped found Motto, Time Inc's website aimed at young women. "I have long admired Arianna as an entrepreneur and a visionary," Schweitzer told CNNMoney. "I have watched her start incredible conversations and really change what people are talking about." After turning HuffPost into a digital juggernaut, Huffington reinvented herself as something of an evangelist for healthy living. She preaches the importance of sleep and the need to untether from technology, often addressing those issues with a missionary's zeal. When asked to describe Thrive Global's aims, Huffington offered a response as pithy as it was grandiose: "Culture shift." Thrive Global will pursue its mission through multiple channels, including published content and corporate training sessions. The content part of the equation will exist on a website built through Medium, the digital publishing start-up that has attracted outlets both large and small. Schweitzer said that the content will come from a team of experts, as well as a community of "contributors and influencers." A chief tenet of Thrive Global's philosophy, as with Huffington's recent books and lectures, is the importance of work-life balance. "Our content and training is going to be about recalibrating our relationship with technology, to allow for boundaries," Huffington said. The training sessions will be conducted both in-person and through e-courses. Huffington said the company has already begun training dozens of people to conduct those sessions around the world, including in China. The workshops and seminars will use scientific research to help managers and employees increase productivity, improve recruitment and reduce the cost of health care, according to Thrive Global's investor deck. Huffington said the sessions will help Thrive achieve its ultimate goal of changing the culture surrounding the way people work and live. "Increasingly as we look into the future, as more and more functions are taken over by machines, what will be a premium is creativity," she said. "And creativity is the first casualty when we are burned out." Altruistic motivations aside, the training sessions also give Huffington an entry into a burgeoning industry. According to Thrive's investor deck, global corporate wellness is expected to become a $10.4 billion industry by 2018. Schweitzer said Thrive's training and editorial operations will inform each other. "We're going to pay very close attention to what works in our corporate training, and we'll also look closely to editorial to see what is resonating with our readers and consumers," Schweitzer said. Along with the training sessions and e-courses, Thrive Global will make money through sponsorships and the sale of products tied to Huffington's lifestyle mantra. Schweitzer's hire comes on the heels of two other recent additions at the company. Former New York Times chief technology officer Rajiv Pant will serve in the same role at Thrive Global, while Kathryan Friedrich, the head of global content monetization at YouTube, is joining the company as its chief marketing officer. Huffington said the company will likely have 25-30 employees across the various departments -- editorial, business, development, to name a few -- by the time it launches in November. When she announced her departure from HuffPost last month, Huffington indicated that she may have overestimated her ability to maintain her roles at both companies. But despite biting off more than she could chew, she insisted that she has continued to "practice what I preach." "Nothing is done at 100%," Huffington said, "but I would say 95% of the time." Disclosure: The author worked with Schweitzer at Talking Points Memo for nine months in 2012.